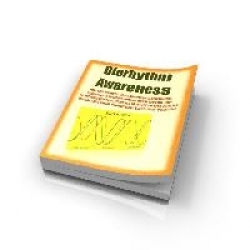 The Biorhythms and the Time of Your Life program (see Figure 2.1) begins by asking for the user's name and birth date. The program then calculates the length of the user's life in years, months, days, hours, minutes, and seconds. Following the user input, the user's name, birth date, and age (in the aforementioned units) are displayed in the worksheet. The worksheet also contains an embedded chart that displays the current state of the user's three biorhythm cycles (physical, emotional, and intellectual). 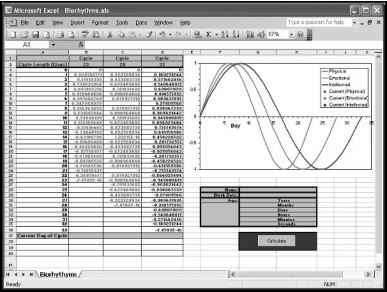 The Biorhythms and the Time of Your Life spreadsheet.